If something good happens, travel to celebrate. If something bad happens, travel to forget. If nothing happens, travel to make something happen! 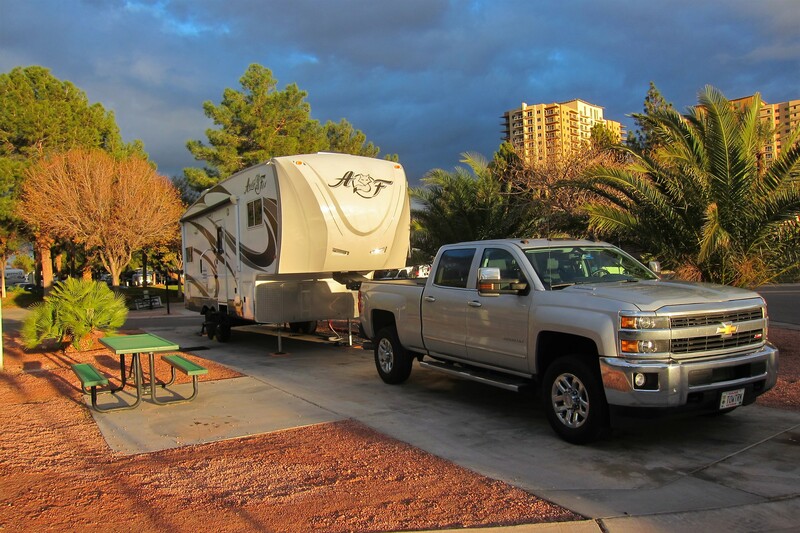 Wednesday, December 21 through Friday, December 30, 2016-Oasis RV, Las Vegas, Nevada: There are three must stops for every Excellent Adventure trip…Tucson, San Diego, and Las Vegas. 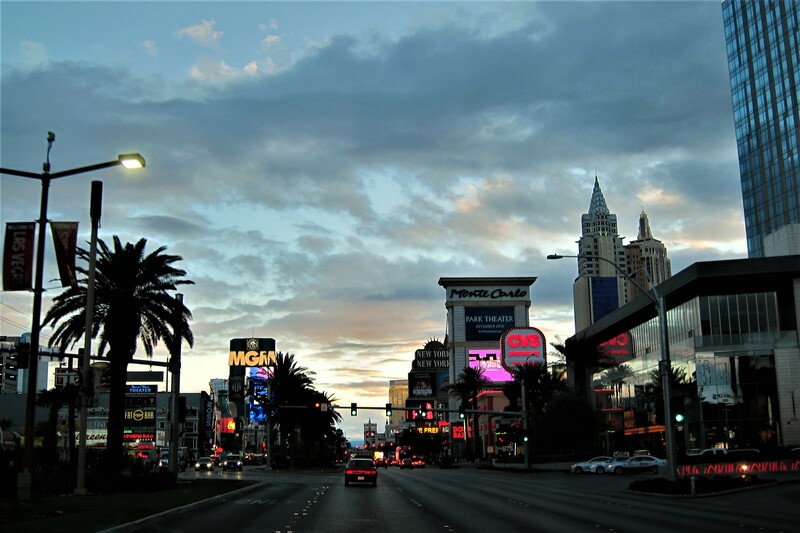 For the next few weeks we will be in and around the entertainment mecca of the world…Las Vegas, Nevada. So, what do non-gamblers do in Vegas? 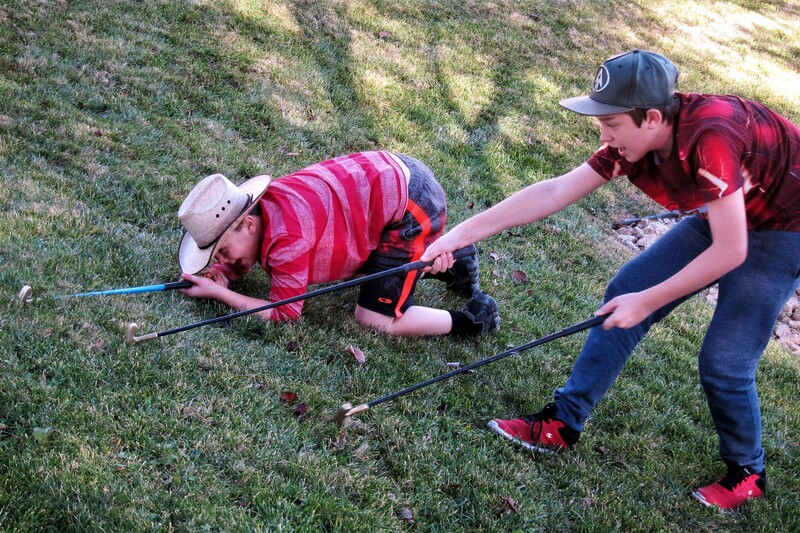 Well if one has two grandsons that reside there, then we do pretty much whatever they want! 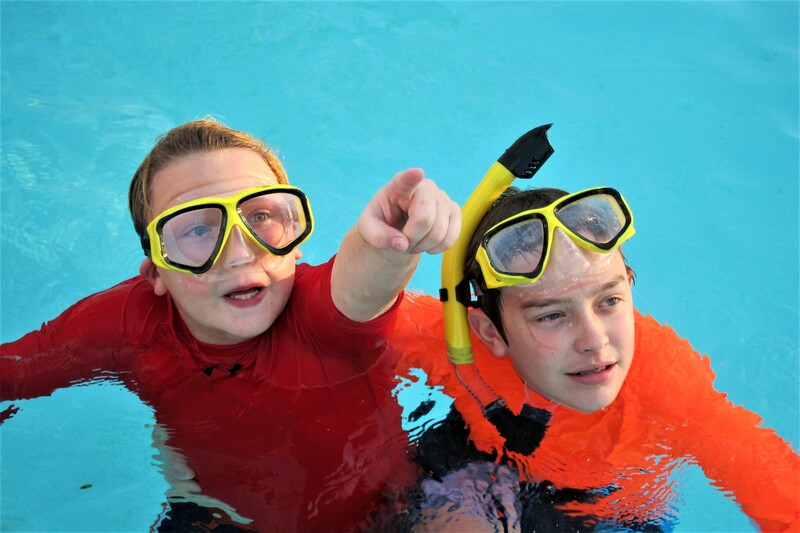 And, if it is warm enough, they spend hours in the RV Resort’s heated pool. Looks serene and placid, doesn’t it? Not for long! The boys would spend hours in the water. Laughing, playing, fighting (hey, they’re brothers! 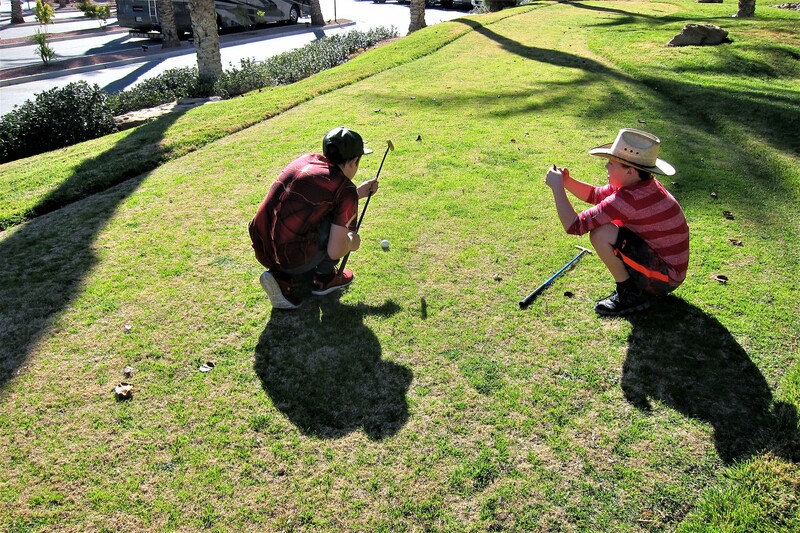 ), and inventing various games to amuse themselves…that is until something else catches their eye. In this case, some hot air balloons floating over the desert to the Northwest of town. Tiring of the pool, or if the weather was a bit cool for swimming, then a rousing round of pitch-and-putt golf was in order. Rules were loosely interpreted, and each hole had a par that was self-rated…often in the 10 to 20 stroke range. 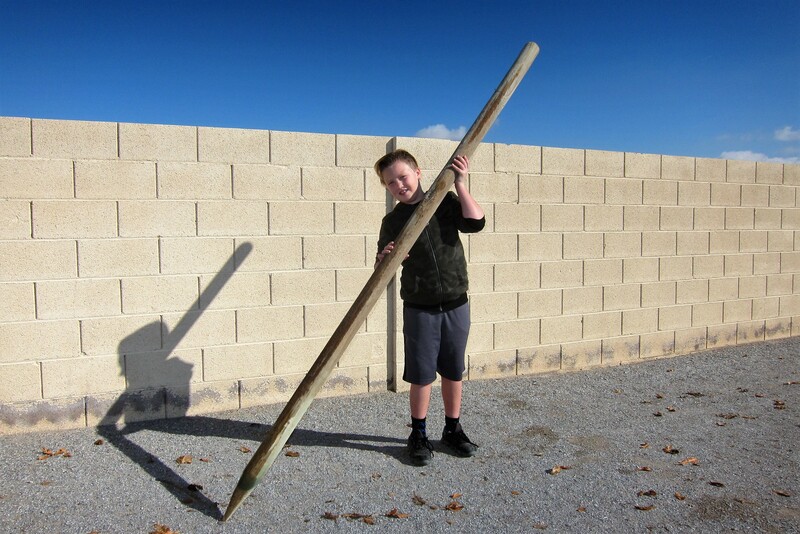 Then, when tiring of this activity, or when the game degraded into “Combat Golf”, the boys turned their putters into climbing axes and scaled the hillsides surrounding the golf course. Those putters will never putt straight again…not that it matters as they were pretty beat up when we received them! While visiting Vegas, it has become an annual tradition to take Jack and Tucker shopping for their parents Christmas gifts. Here you see them discussing the relative merits of different packages of rectangular plastic nocturnal foot impaler’s. 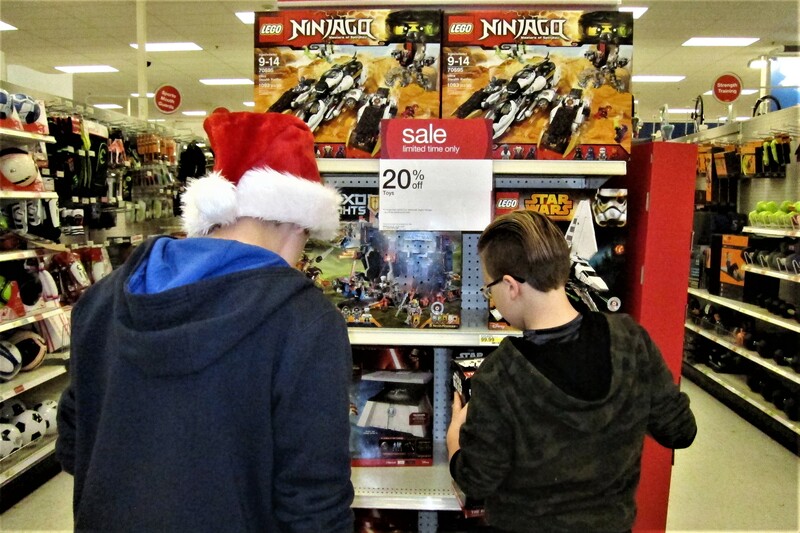 I tried steering them to more age appropriate gifts but the boys kept returning to the toy aisle. Hope you enjoy Lego’s Kevin and Suzie…oh, and the bags of candy they selected for you as well! 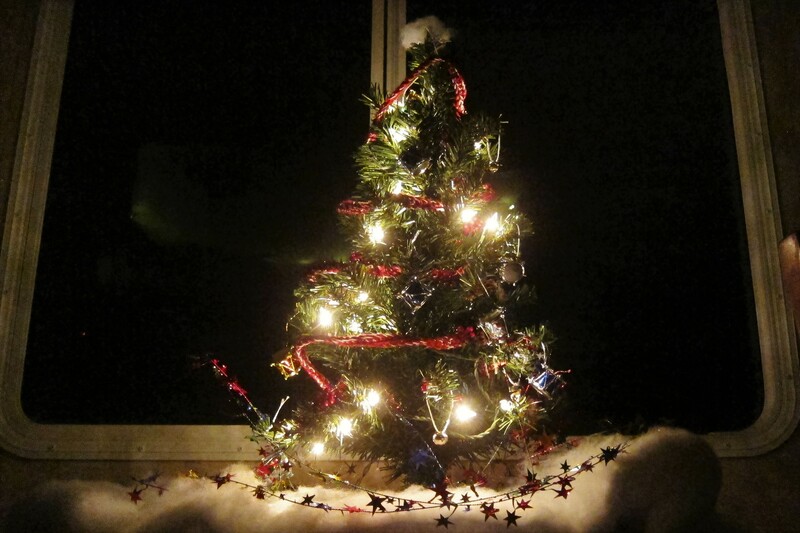 A while back, Kit purchased a camper sized Christmas tree. 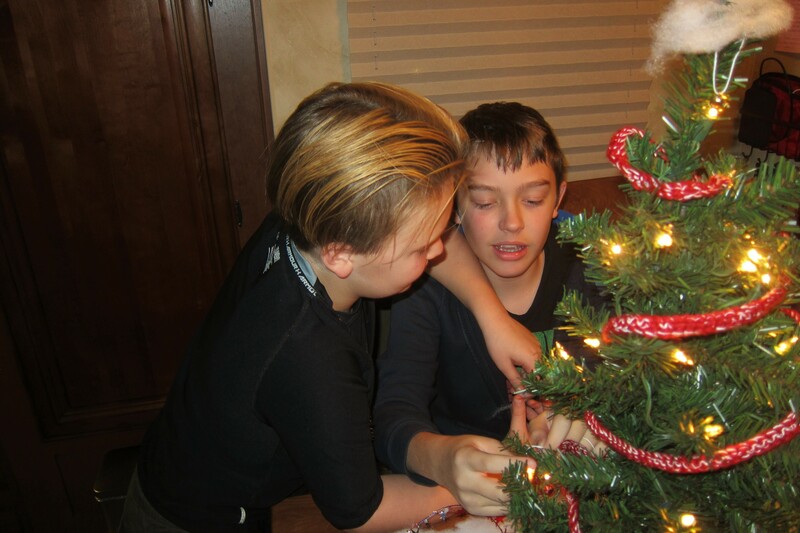 And on one evening during a sleep over, the boys were put to work in the trees decoration. Excellent job, don’t you think? On Christmas eve, Jack and Tucker stayed at their home in order not to waste any time getting to the presents in the morning. At the ungodly hour of 0630 we were summoned to get over there stat…and that we did! 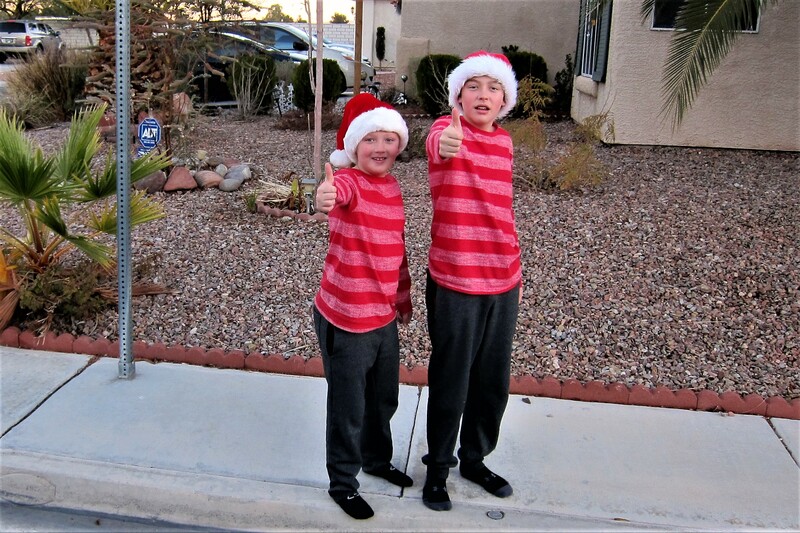 A Vegas tradition is for us to text the boys our ETA…so it wasn’t a surprise that when pulling into their neighborhood, Kit spotted these two munchkins waiting our arrival a few blocks from their home. Yep, in their Christmas pajamas and without shoes! Taking pity on the cute hitchhikers, we loaded them in the truck. Delivering them home, it was time to get down to business…let the wild unwrapping rumpus begin! 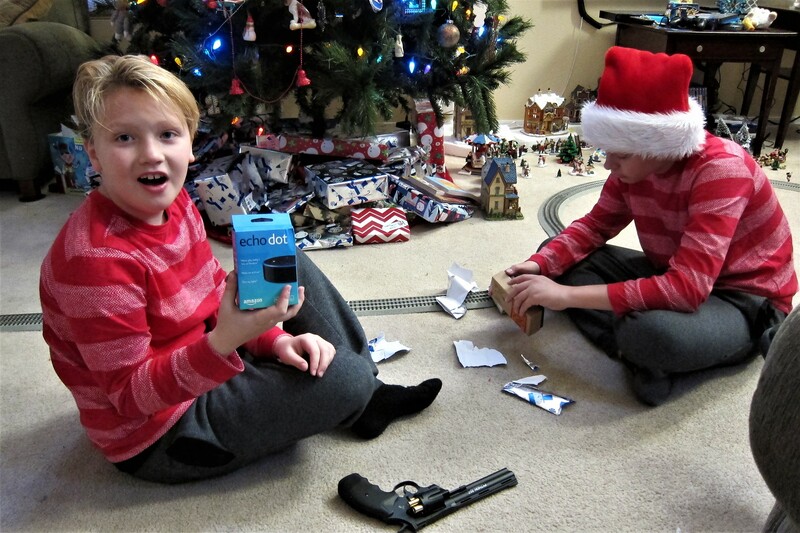 Amazon Echo Dot’s and Smart Bulbs for each of them and a shiny new Colt 357 Magnum for Tuck…which will come in handy at his bartending job on the Vegas strip! 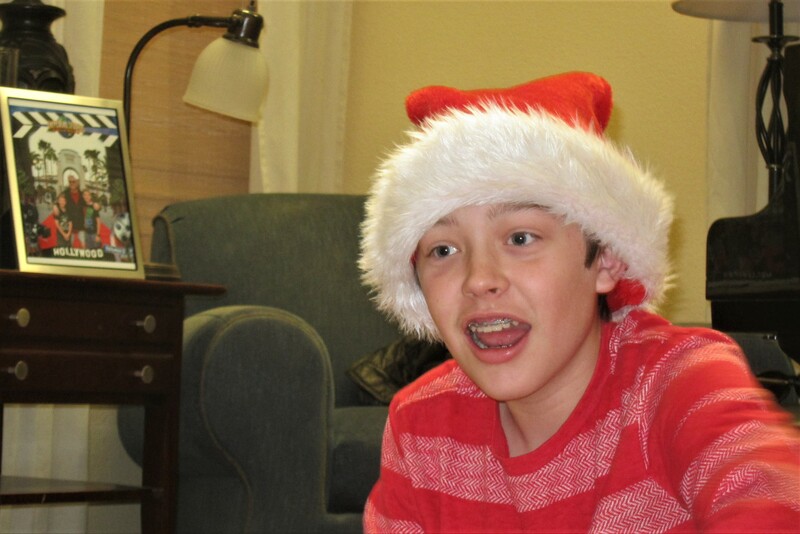 And, Jack was very pleased by his Lego sets and video game cartridges. Suzie and Kevin kindly gifted Kit and I a DNA test kit from 23andMe! Suzie had her DNA mapped a while back and discovered that she was not adopted from Tijuana as we had always surmised…but actually of Eastern European extraction. Which still leaves the issue of adoption unanswered as Kit’s kinfolk hail from the British Isles, and my being born in Hawaii would lead one to believe there is a Polynesian connection. The determination of one’s heritage through DNA analysis is a burgeoning field. I’m guessing that the easiest way to tell a male chromosome from a female chromosome is to just pull down their genes! So, with that knowledge, how long could it take to analyze our provided samples? Anyway, whenever it is available, Kit and I will share the results of our individual DNA tests in a future journal. I can just feel the anticipation of the few folks that actually took the time to read this! 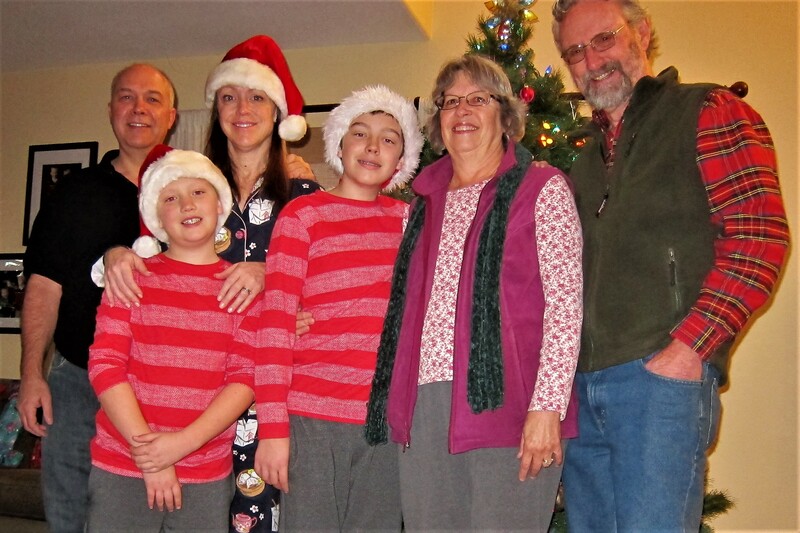 As the boys continued to enjoy their new gifts, Suzie began organizing the traditional Hodgepodge Christmas meal…a random collection of each person’s favorite foods. This year’s menu consisted of Buffalo Wings, Cheetos, roasted Brussel Sprouts, bacon, Broccoli salad, and Suzie’s signature homemade popovers! 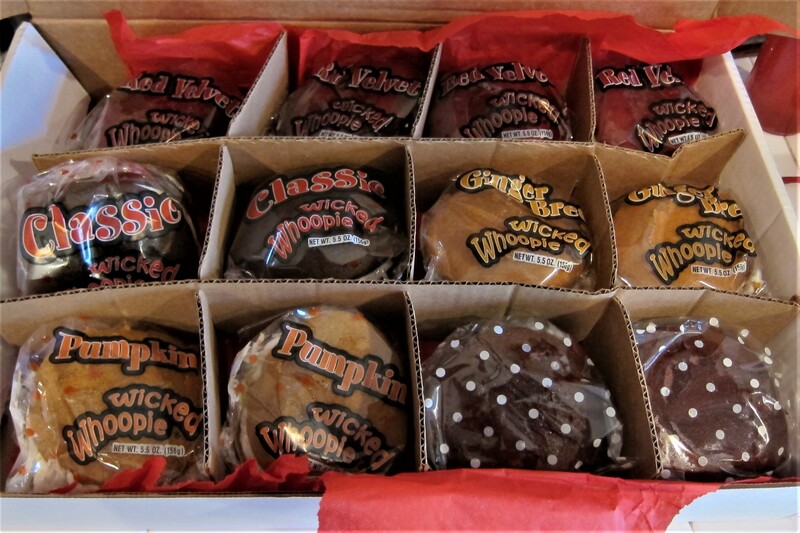 Then for desert we all enjoyed a real Maine treat…Wicked Whoopie Pies, sent for the occasion by our oldest daughter…Thanks Kim! Kit and I enjoyed a nice festive day! Unfortunately, Kevin had to work, because as the saying goes, the show must go on. However, I was able to capture a family Christmas photo before his departure. Thanks folk for once again allowing us to share in your Christmas traditions…we thoroughly enjoyed the spending the day with you all! Everything quieted down a bit after Christmas day and I was able to take care of some preventative maintenance on the truck and trailer. Traveling over 3,500, miles in all types of weather, rendered the camper pretty filthy. Unfortunately, in the desert during a prolonged drought, one cannot simply wash their vehicles as we might do back home in Maine. But fortunately, there are plenty of mobile RV wash business that use minimal water to get your unit sparkling as new! An excellent job and very reasonable considering the two young fellas spent the better part of the day washing and waxing every inch of the rig…upon completion, our baby sat gleaming in the waning sunlight! 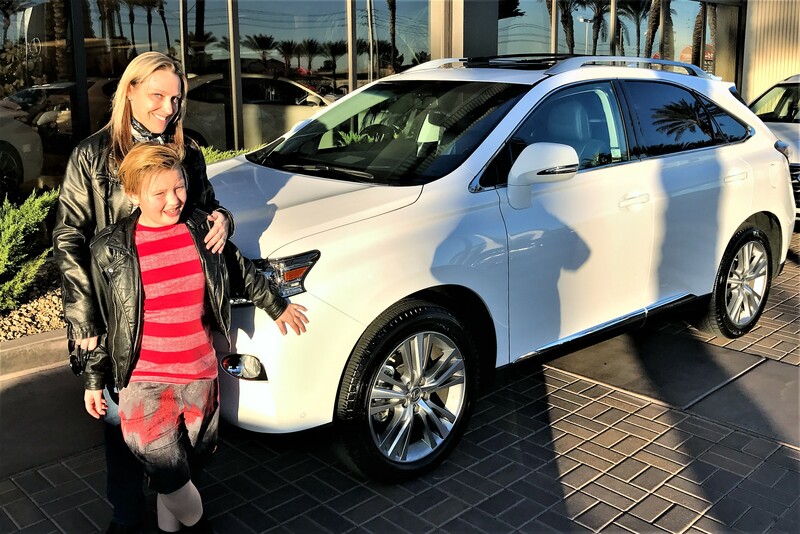 During our stay, daughter Suzie decided it was time to relinquish her 12-year-old Prius and get what she described as a “big girl car”. 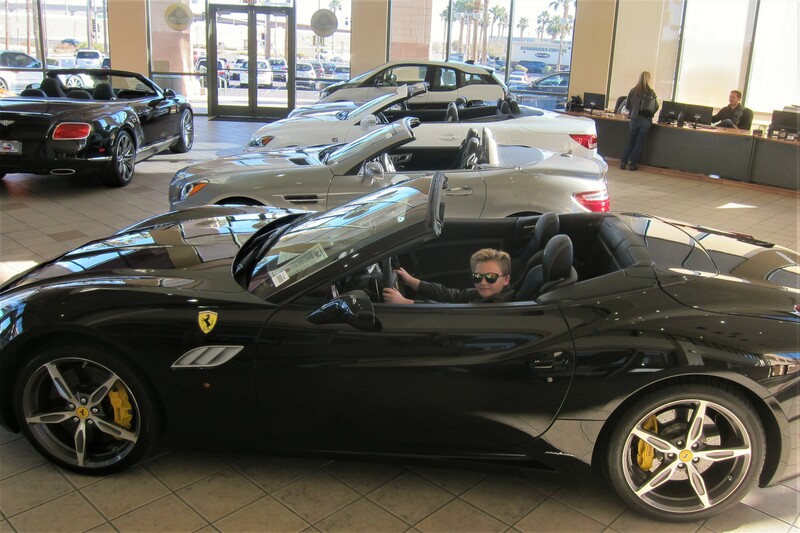 So, while Kit and Jack went to Barnes and Noble, Suzie, Tucker and I went car shopping. At the first dealer, this vehicle was front and center in the showroom. 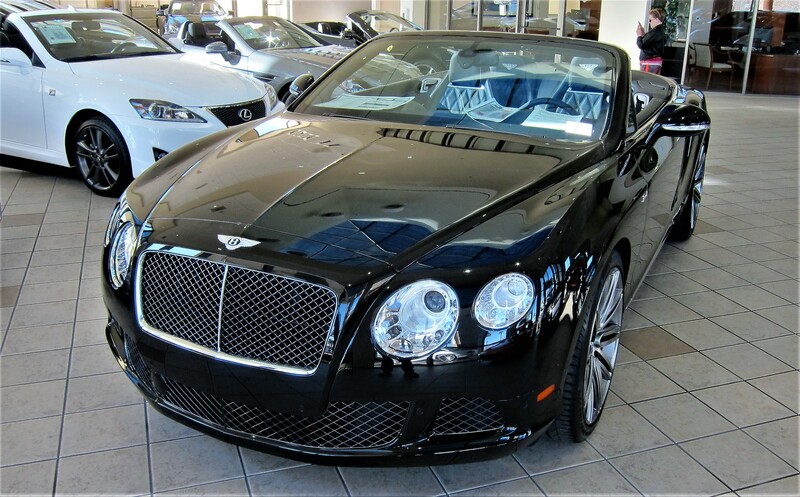 The Bentley Continental GT Convertible was very nice, but it isn’t a very practical family car. In addition, at an MSRP of $255,570.00 it is a bit outside a sensible budget. Grandson Tucker spotted another possible candidate…one he liked very much! But alas, the Ferrari did not pass the “mom practical car” test either…nor did the one I personally liked. Yep, this place sells classic cars as well. 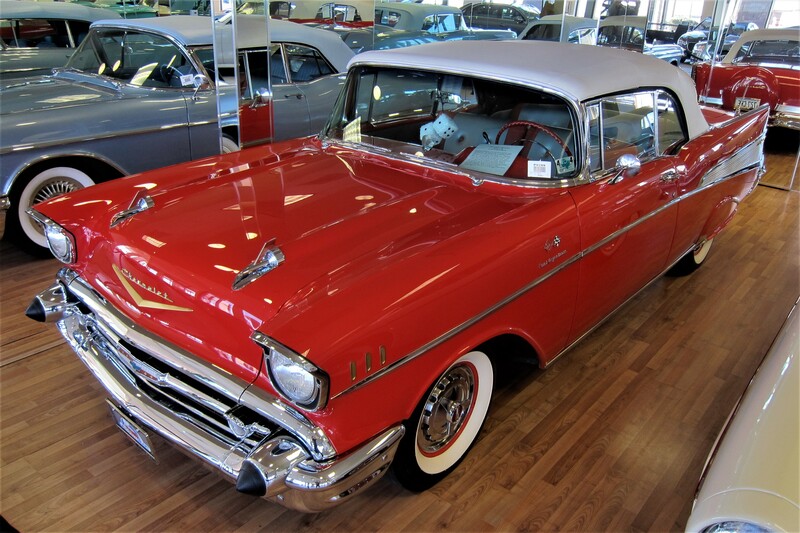 However, this 1957 Chevrolet belonged to the dealerships owner and was not for sale. 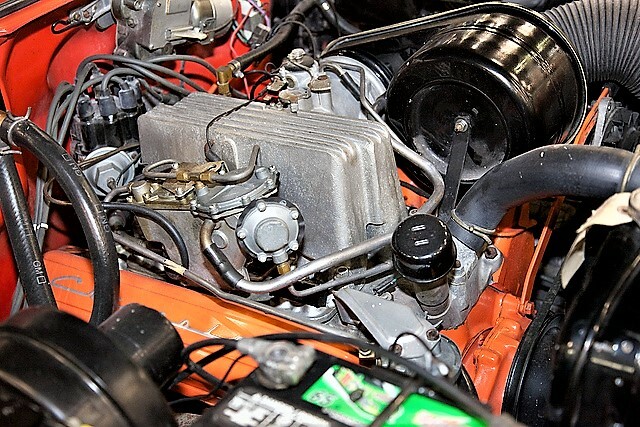 According to him, it is one of only eight authentic 1957 Chevy convertibles with factory fuel injection known to exist! A very rare automobile and worth far north of six figures! It was obvious we weren’t going to find a suitable family sedan at this place so off we went to another dealership. Where Suzie found a perfect car, and being near the end of the year, the dealer was willing to negotiate! She really liked this vehicle, and admittedly it was far more practical then what Tucker or I would have had chosen…a nice upscale car, and it rides like a dream! 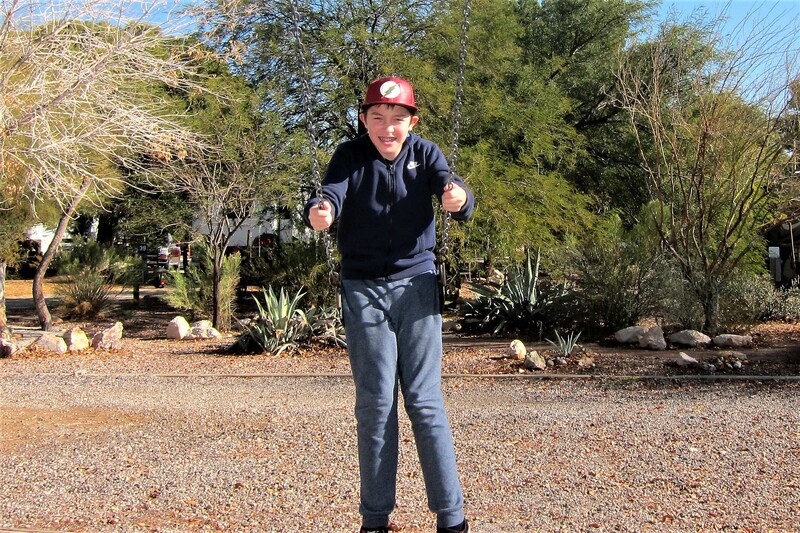 Well…tomorrow is New Year’s Eve and Oasis RV park is booked solid, so we must move on out. This is one of the rare times that our lack of making reservations has resulted in being required to develop alternate plans. Since we like traveling unencumbered by advanced planning, when it does happen that there is no room for us, we just deal with the inconvenience. Saturday, January 31, 2016: Since checkout time at Oasis RV isn’t until noon, we spent a leisurely morning with grandson Tucker’s help in getting the rig ready for the day’s travels. 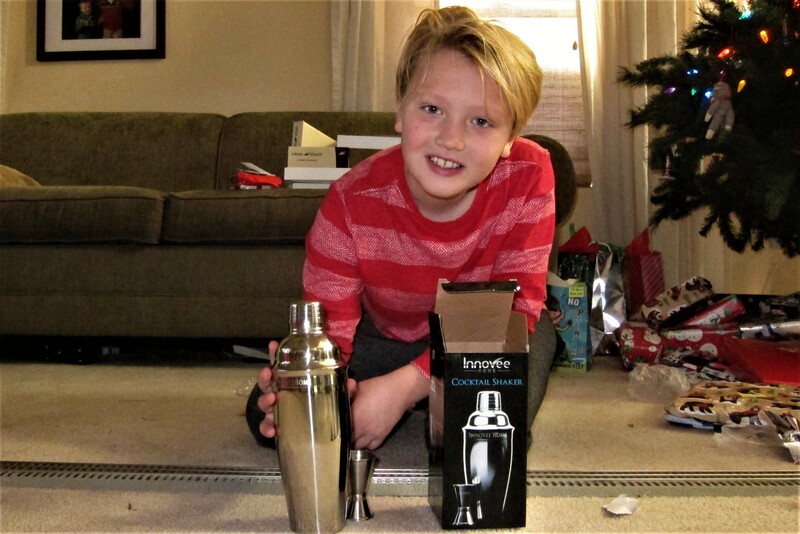 Grandson Jack was on a sleepover party at a friend’s house and will join us later in the day. On the road at 1130 hours and hitting Interstate 15 heading east. A short 22 miles and 30 minutes later found us pulling into Nellis Air Force Base where we scored a partial hook-up site for the next few days. Spent the afternoon hanging out and walking the one mile trek to the base mini-mart for a Redbox movie and some snacks. 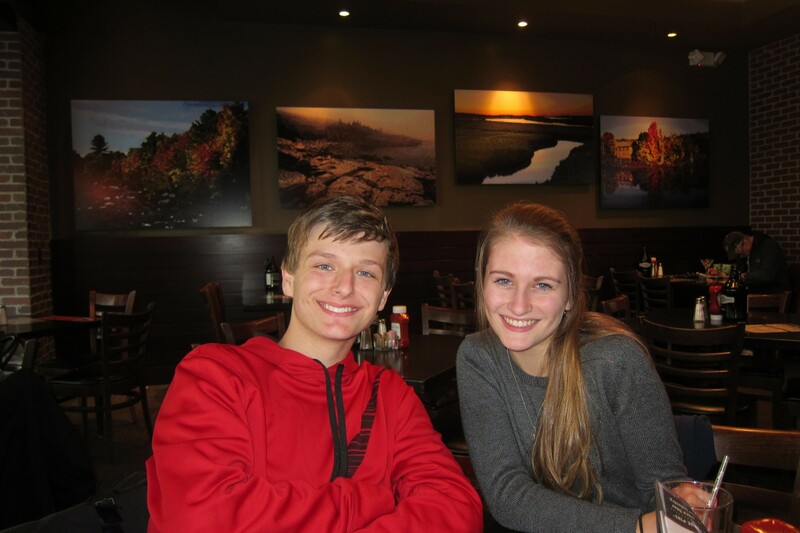 Around 1600, daughter Suzie delivered grandson Jack and we enjoyed a nice meal and viewed the movie “Central Intelligence”, a comedy starring Dwayne Johnson…it was pretty darn good! 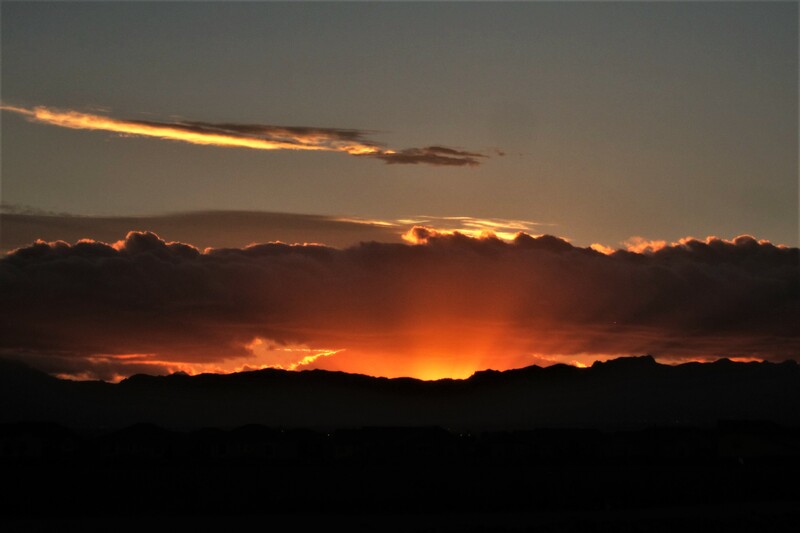 As was this evenings Nevada sunset! With everyone tucked into bed we bid you a fond Goodnight! 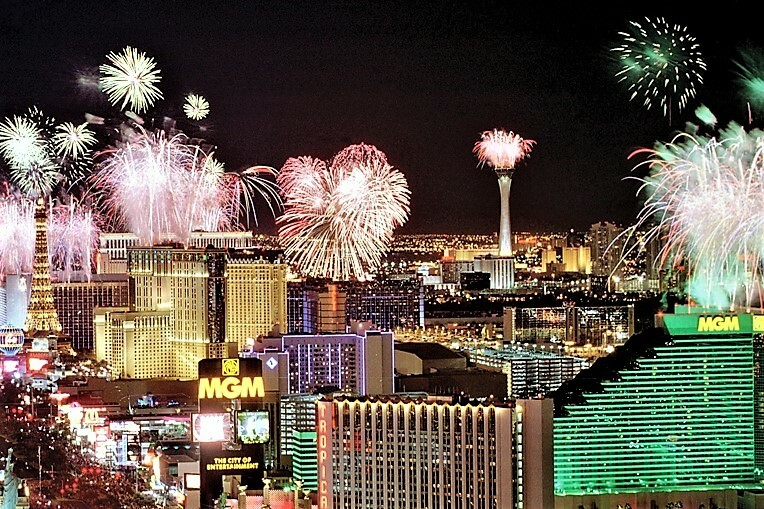 Sunday, January 1 through Sunday, January 8, 2017-Nellis Air Force Base, Nevada: Happy New Year from Las Vegas! Being a few miles from the strip, Kit and I only saw a bit of the fireworks display but heard the booming noise while Jack and Tucker slept through the whole thing! 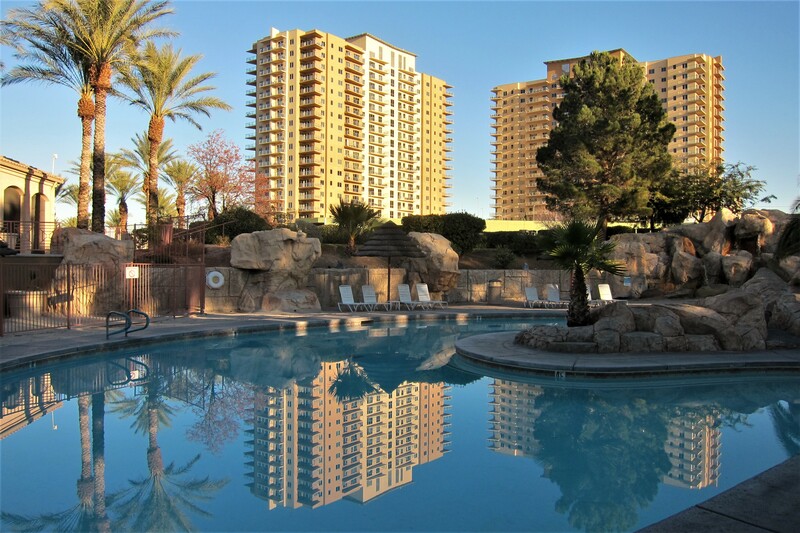 We have had family in Las Vegas for the past 12 years and have visited here often. Kit and I have seen, and journaled about, many of the sites and cultural events in the city as well as the surrounding countryside. We now spend most of our time with the grandkids doing whatever they want to do, which is usually just hang out with us. It is a real treat watching as they participate in creative play and seem to enjoy time away from school, friends and their parents…as I’m sure Kevin and Suzie enjoy some alone time as well. Jack and Tucker spent most of the time hanging out at the playground, digging in the dirt or walking to the mini-mart for treats. On one of our walks, Tucker spotted what looked like a giant pencil so he decided to use it to write his name in the dirt. 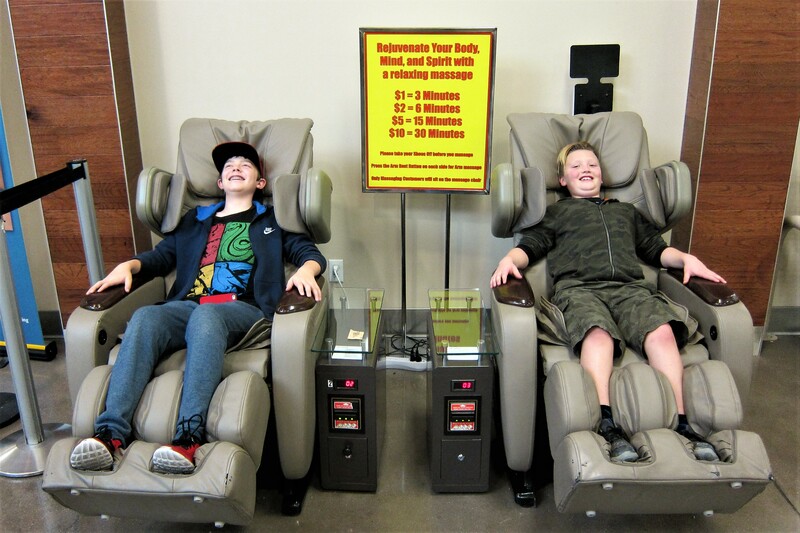 And during a trip to the base exchange, the boys felt a need to receive a relaxing $1.00 massage. I guess it’s a lot more stressful growing up in white middle class America then it used to be!?!? 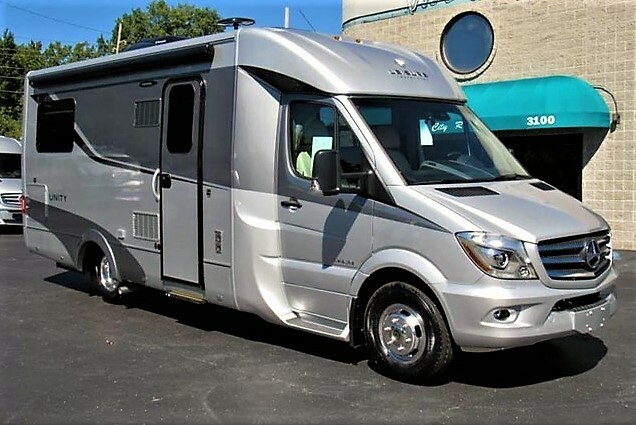 As avid RV’rs, Kit and I are occasionally on the lookout for our next rig, it’s also fun to visit RV dealers to peruse the newest floorplans and amenities. 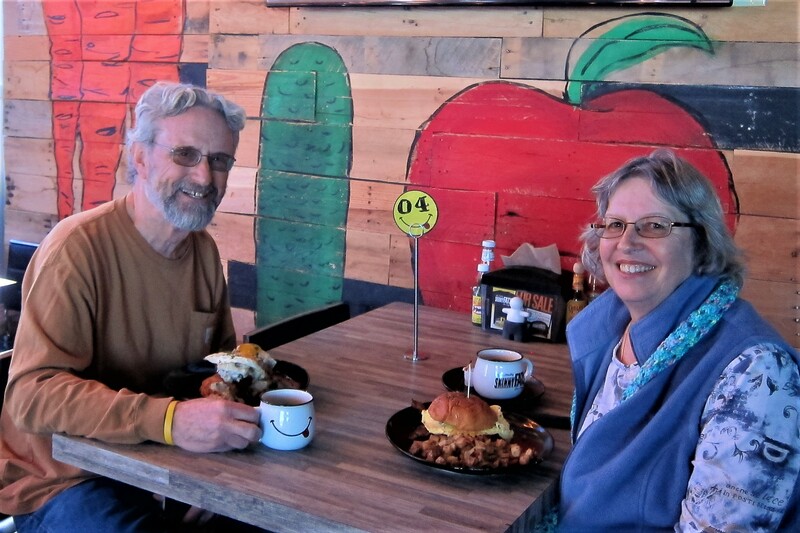 For this stage of our lives, living in our 30-foot camper for six months a year, we are completely satisfied with our fifth wheeler…however, if we remain healthy, and if the lure of traveling the roads of America persist, there will be another rig in our future. While in Vegas, Kit and I decided to visit one of the largest dealer networks of Class B motorhomes. After a few hours of checking out these diminutive but functional motorhomes it was time for a late lunch. Checking on the iPhone for suitable candidates, we discovered a nearby joint with the unusual name of Skinny Fat’s. 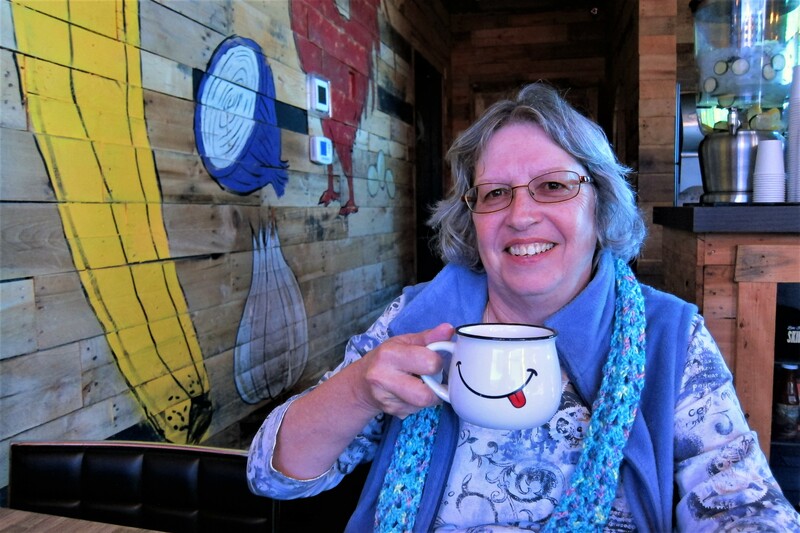 The eclectic menu has a “healthy” page and a “happy” page….we chose the latter. 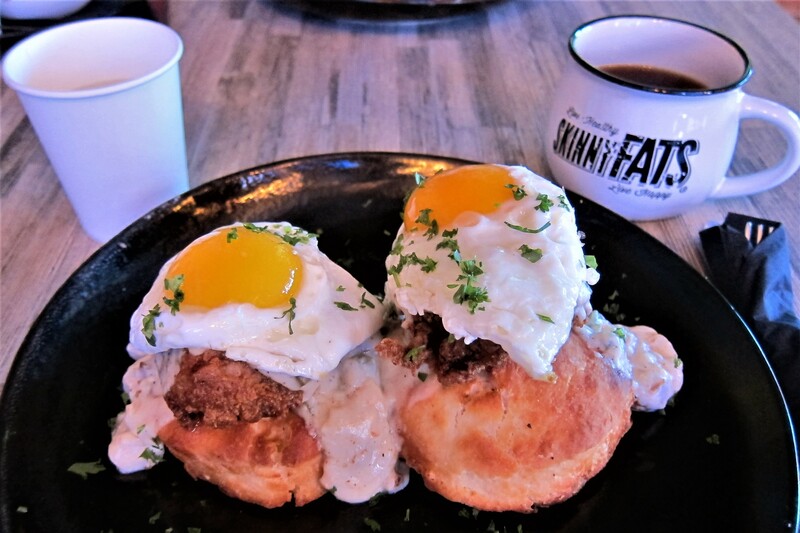 The above offering is called Snake Eyes…two tasty biscuits, covered with southern gravy, a chunk of fried chicken, and topped with a fried egg! It was incredible!!! Lingering over coffee we had a nice conversation about the current crop of RV’s as they relate to our future needs and desires. Not ready to trade in quite yet, but when the time comes, a class B motorhome might just fit the Bill (pun intended)! Returning to the campground it was time to walk off some of that huge lunch! 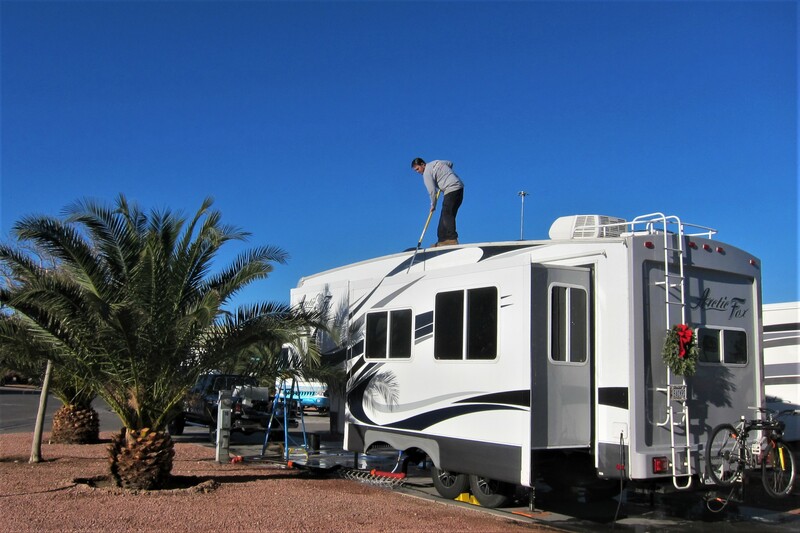 Desert Eagle RV Park on Nellis Air Force Base is significantly upgrading their facility. 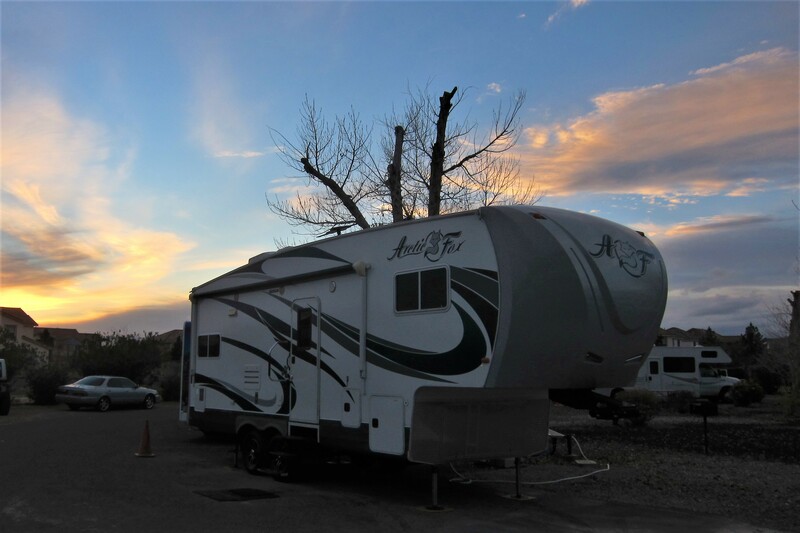 As one of the top-rated military RV parks it is frequently booked solid throughout the winter months. The proximity of the Vegas Strip to the south and Las Vegas International Raceway to the north helps as well. 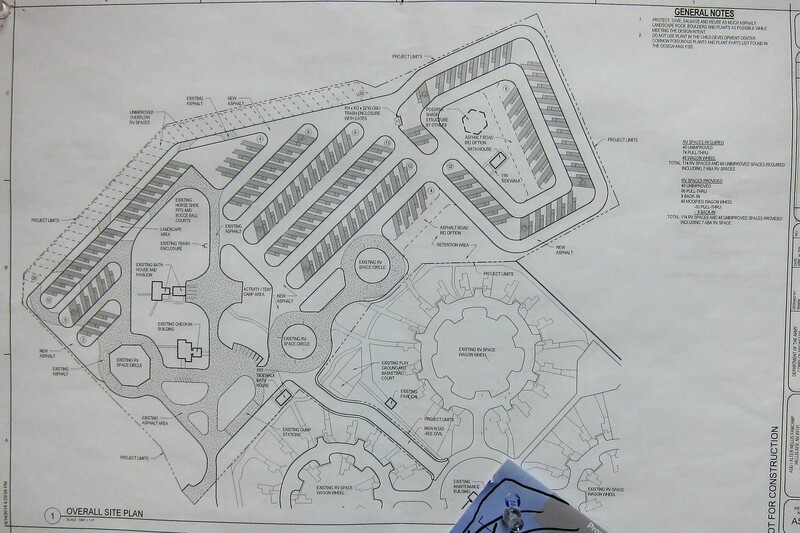 The plan is to build an additional 81 full-hookup pull through sites as indicated in the photo below. The new pull-through sites are shown in the upper left, replacing the partial hook-up ones which we tend to get assigned due to our not making advanced reservations. This improved capacity should allow us to obtain a nice site in the future without planning a year in advance as the homesteaders do…well, except for NASCAR Weekend when every single site is booked! 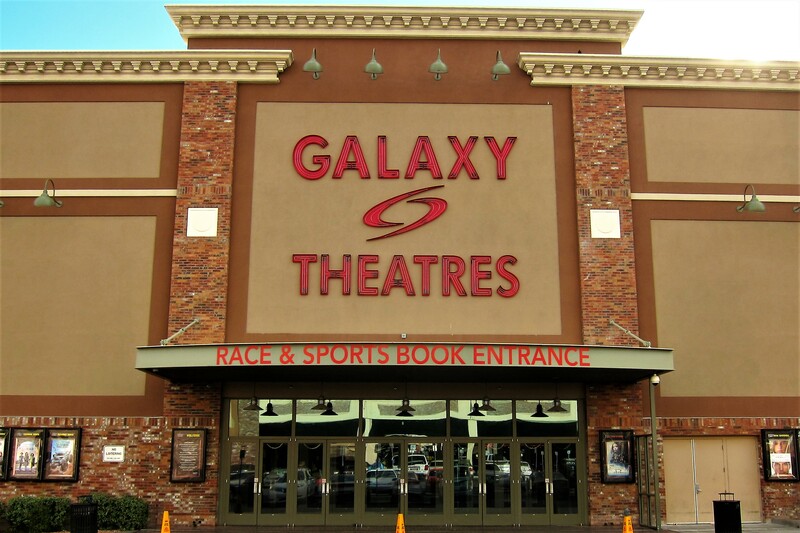 While staying with us, the boys wanted to see a just released movie so we took them to a Galaxy far, far away. 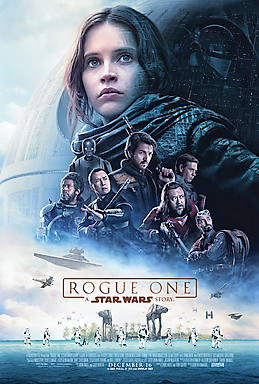 To enjoy the latest Star Wars film, Rogue One. Well, it wasn’t that far away, but the film was entertaining even though I was lost a few times following the story. Fortunately, Jack who has seen every Star Wars movie multiple times, was able to sort out the characters and plot for me. It has come to pass that our two-year-old, and very well used camper, needed some updating. Being a mid-level quality unit, our trailer was outfitted with contractor grade components…better than the plastic seen on many entry level units but not as good as the high-end RV’s. Considering this, it was time to continue our replacement plan, which this time was the kitchen faucet! 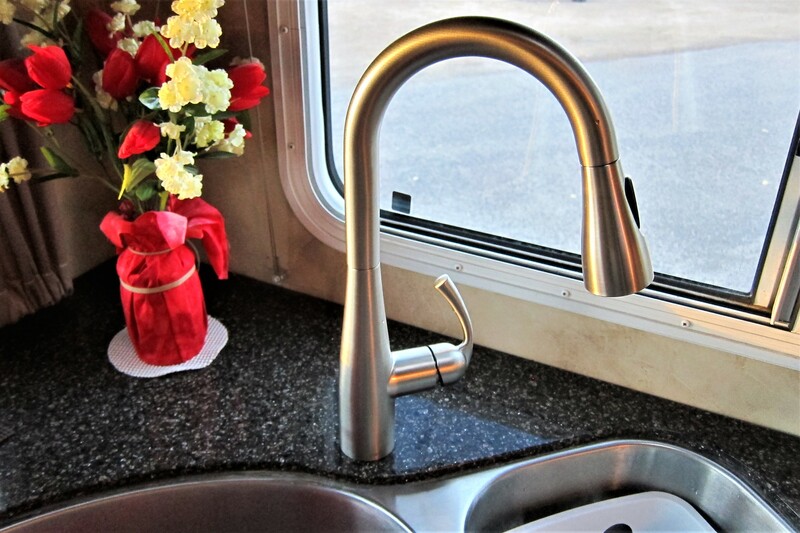 The Moen brand Kit selected has a pull-out sprayer and goes better with the stainless-steel sink than the old bronze faucet…she was very pleased with the outcome! There are a few different routes to drive the 18 miles from our campsite in North Las Vegas to the kid’s house in the south. Either Interstate 15 and deal with the congestion of the infamous Spaghetti Bowl…or straight down Las Vegas Strip, which takes more time but is infinitely more entertaining. 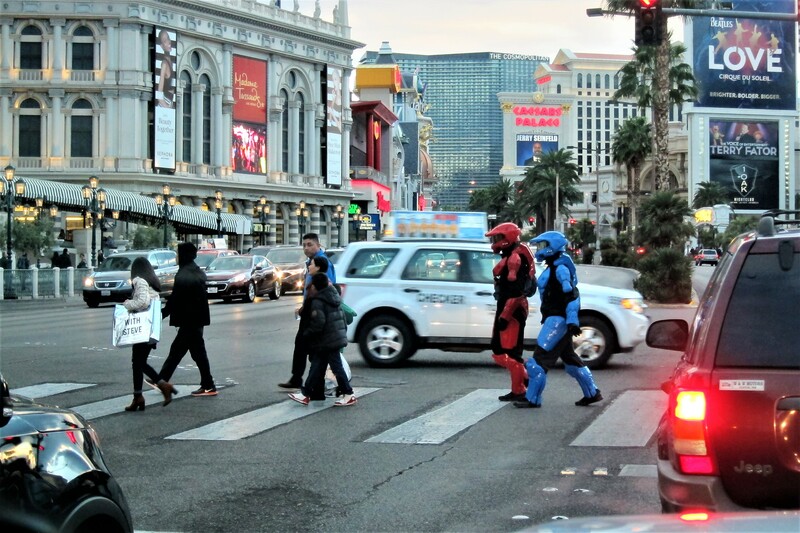 You never know who or what you might spot along the strip! As our stay in the Las Vegas Valley comes to a close, I would be remised if I didn’t mention our family wintering over back home in Maine. 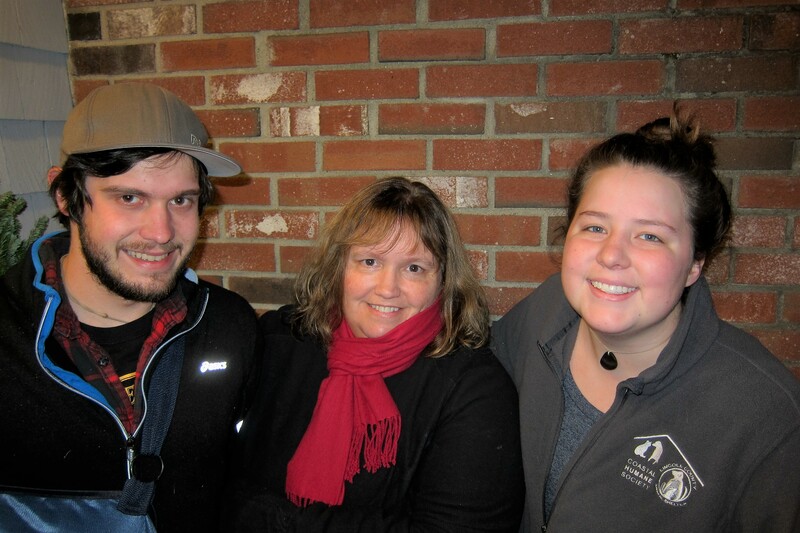 First there is our daughter Kim and her son Joe along with good friend Abby. 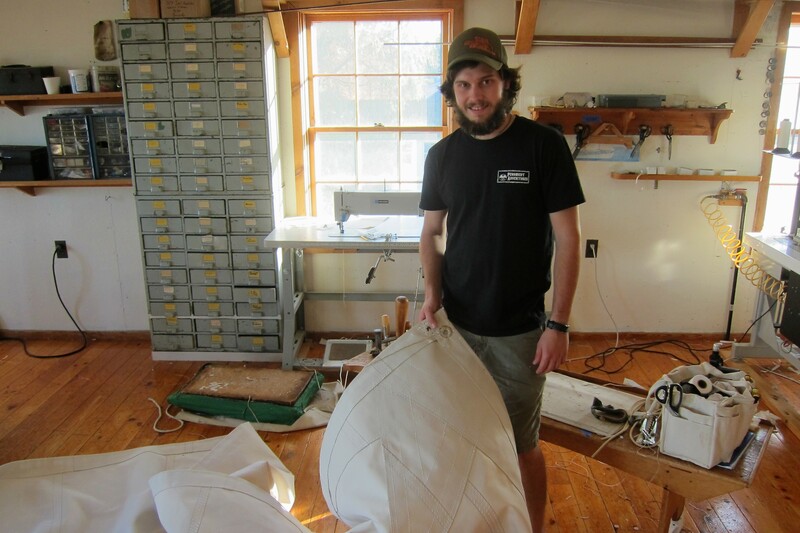 Most days finds Kim hard at work as a Unit Coordinator at the local hospital…Abby caring for animals at the regional human society…and Joe working as a sailmaker for a prominent sail loft that specializes in traditional sails for antique vessels, including the USS Constitution, the oldest commissioned warship in the US Navy! 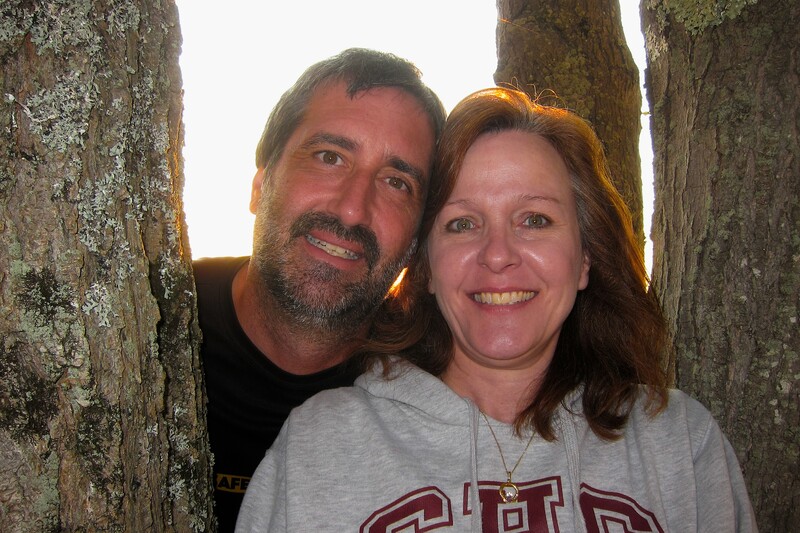 Then there is our son Joe and daughter-in-law Ann who live about an hour away. Joe works as an IT engineer for a start-up firm in Portland, and Ann is the COO/CFO for a nonprofit medical group in the same city. 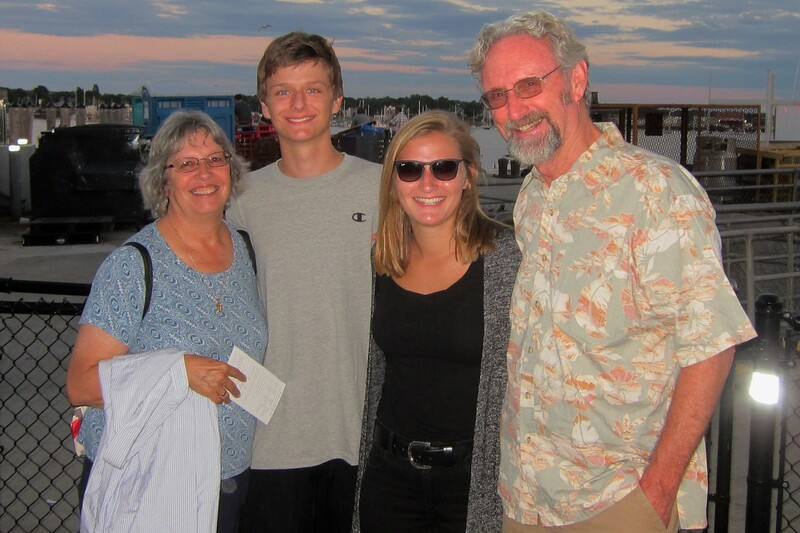 Next are their two offspring…our granddaughter Katie and grandson Christopher, who we enjoy spending time with as often as their busy lives allow. 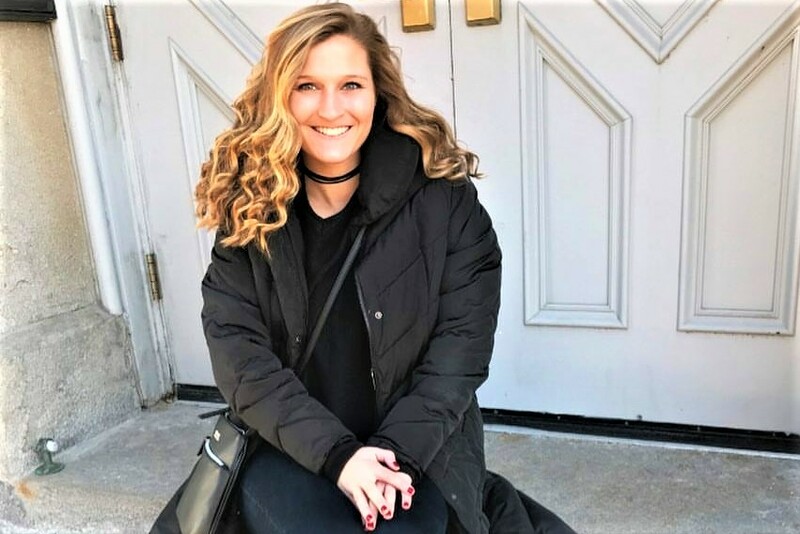 Katie is a Junior at a New York College where she plays Lacroix and is a member of the National Honor Society. And Christopher is a High School Junior who also plays varsity Lacroix and is a high achieving scholar as well. The delightful young lady with Chris is his friend Maddie and the newest member of the extended Tucker clan. As much as Kit and I enjoy traveling about the US, we really miss spending time with the family back home, which we try to make up for during the warmer months when it is safe for us to return! Speaking of warmer months and Maine, below is a sunset shot from our porch at the family camp on Sebago Lake…great times and memories are made there! Tomorrow we break the cobwebs from the camper’s tires and hit the road in search of other adventures…stay tuned. 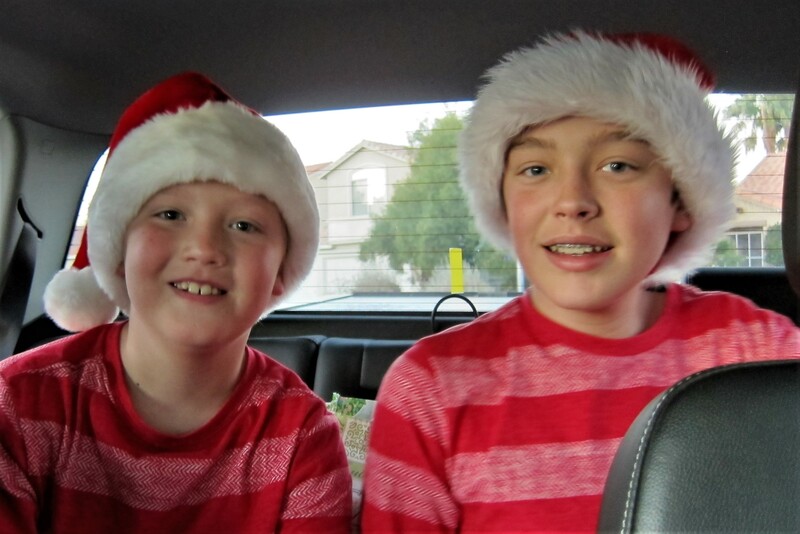 Kit’s Bit’s: Another holiday season with our two youngest Grands, Jack & Tucker. These boys are growing up so fast! Jack, who just turned 12 is in the throes of puberty! Yes, it begins earlier these days! His voice is much deeper and he’s into that “spacey” phase where he is lost in his thoughts! Until his brother Tucker starts teasing him! At that point, they go into full battle mode, for about two minutes, then break into laughs and are best buds again! Sound familiar, John? My son-in-law bought that same model Lexus SUV in black! A beautiful ride and the interior bells ‘n whistles are awesome! Great choice! I wholeheartedly agree that Tucson, San Diegao, and Las Vegas are must stops! ….The DNA tests! What a great gift idea! Can’t wait to hear those results!! 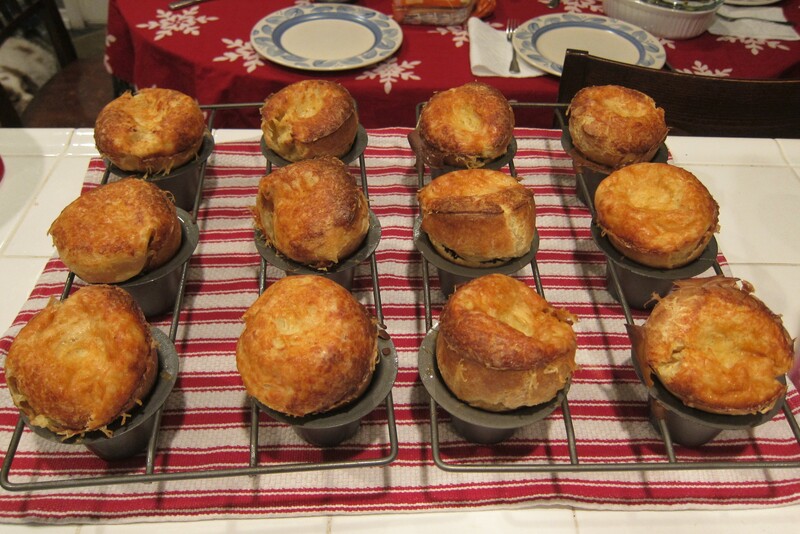 ….Hodgepodge Christmas Dinner…what a concept and so perfect! 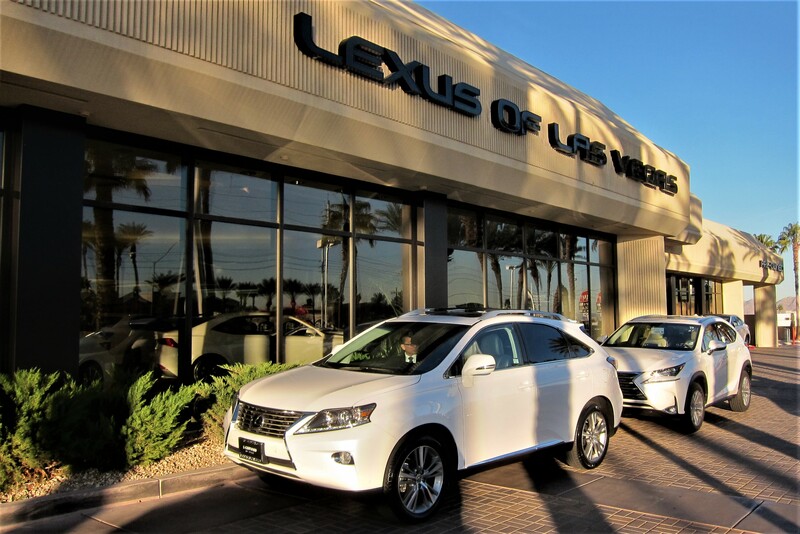 Very thoughtful gift from Kim too with the Wicked Whoopies… Suzie picked the right family car too..Lexus? Excellent choice. …. 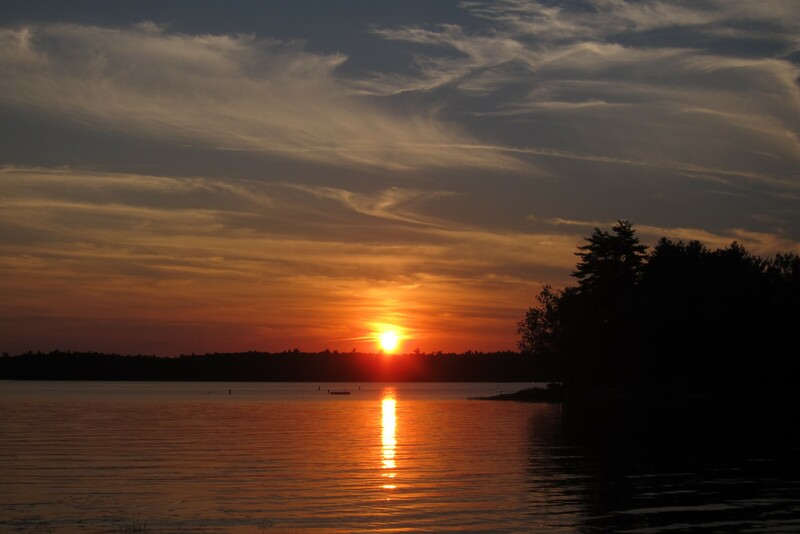 Hard choice on which sunset was the best…Nevada or the sunset at your Maine camp? !……The pics and backgrounds on your family at the end….WOW! You two must be incredibly proud. Very accomplished and a very attractive group! Thanks for the kind comment concerning our family…we are indeed proud of them all! The DNA testing has not been completed yet, but rest assured, when it is, I’ll post the results in an issue of the travel journal. 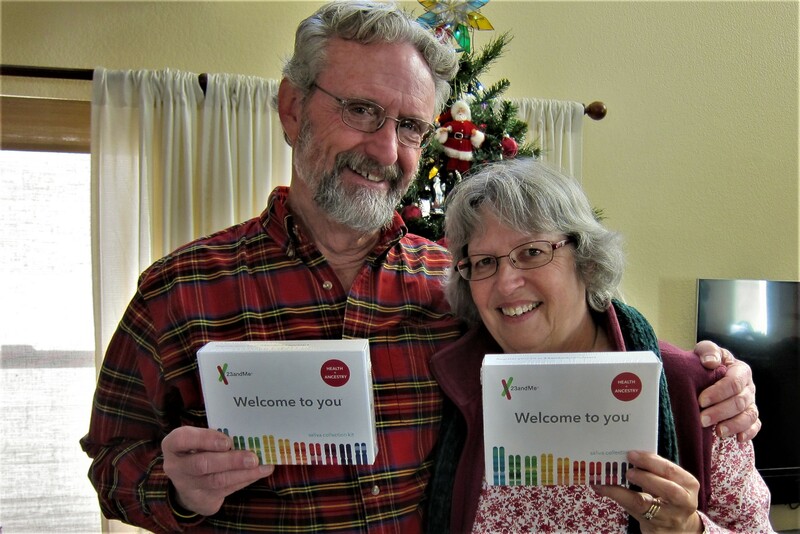 chuck and I bought DNA tests through Ancestry and had my dad and my mom’s brother do the DNA testing. For Ancestry it works better if it is a male ancestor. We picked the oldest living male member on both sides of my family. The results were quite interesting. Some confirmation or what I already knew and some surprises. My dad lived in Tucson for 40 years. Last spring he moved to SD. He is coming to visit us in TX starting tomorrow. We are both looking forward to seeing each other and he is looking forward to the warm up. 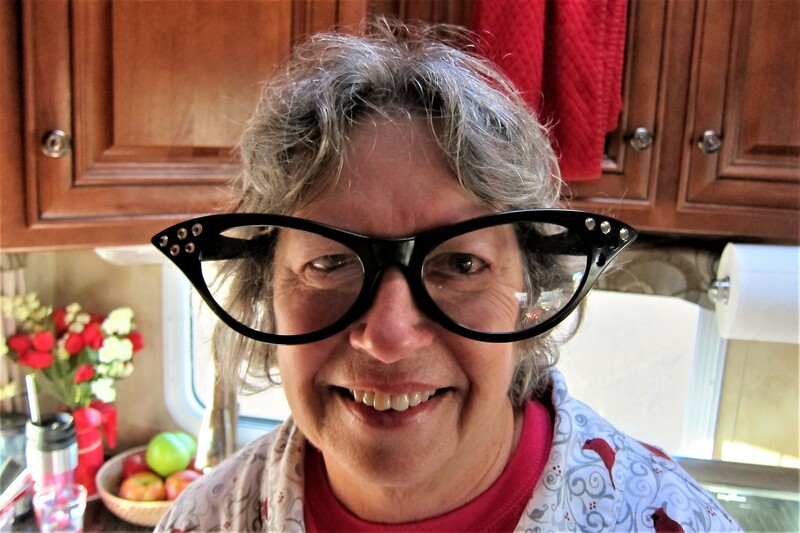 Hi great to hear from you, and sorry about the delay in replying…as you know, it’s a fun and busy time in RV world! As it turns out, we have two different DNA analysis’s pending…one from Ancestry.com and the other from 23andMe, ought to be fun comparing the two! Well…you’re in good company, it takes me a month to reply! Glad your enjoying the blog!! We have 2 1957 Chevy golf carts here in the park and one is red and white! The other is “aqua” and white like the 1956 Chevy we had when we got married! I like your car choice, Bill. We’ve seen a few of those retro golf carts in Sun City as well…if I was to live in a golfing community, I’d get a 1947 Ford Woody!